When most people think about technology being exported from California, we think about Silicon Valley – Google, Apple, and Facebook. But it’s a rather non-descript group of buildings in Orange County that are attracting world attention. A steady stream of scientists, engineers, and politicians from drought-stricken places like Australia and Israel visit regularly to learn what is going on within these concrete walls. What attracts them? A new, clean source of water that can quench the thirst of growing populations, even during drought. OCWD’s Groundwater Replenishment System is a drought-resilient source of water for the northern section of Orange County. In the 1970s, Orange County had a serious problem with their water supply. Water from the beautiful Pacific that we all love so much was seeping into the groundwater we drink and use every day. The solution that the Orange County Water District engineered set them up for creating a drought-resilient water supply that is helping us cope with less rainfall. 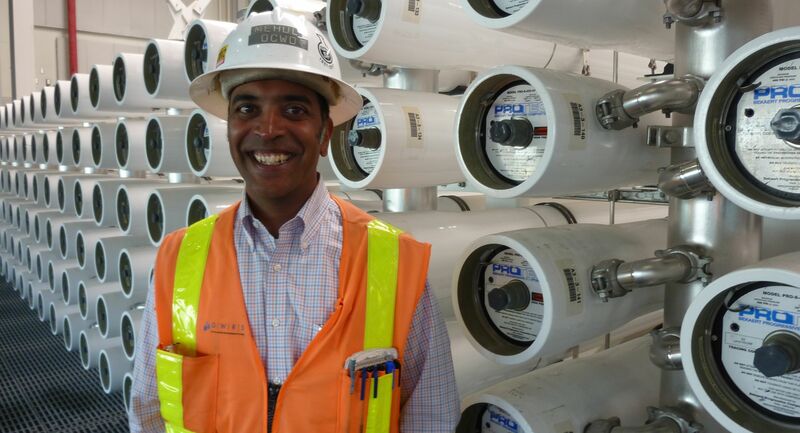 Mehul Patel started as an intern at OCWD and now heads the Groundwater Replenishment System. To solve the problem, engineers at OCWD found a way to purify used water (or wastewater) and inject it into the barrier, so that the more expensive imported water could be reserved for drinking water supplies. The plant that created this water source was called Water Factory 21. More people require more infrastructure. 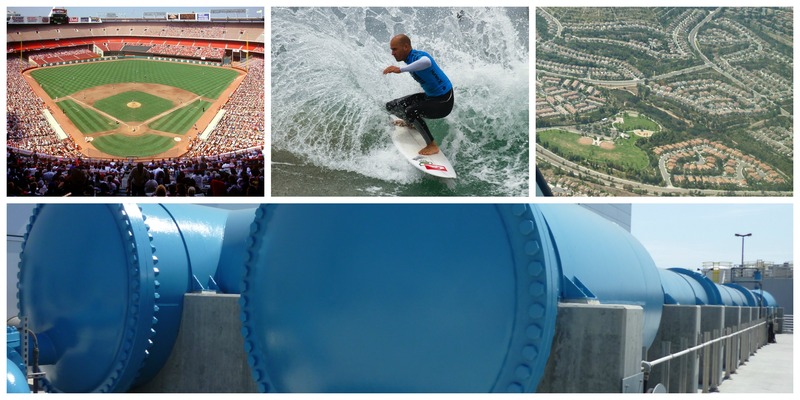 Photo Credits: Anaheim Staduim – Jerry Reuss, Surfer – Pedro Szekely, OC Subdivisions – Raymond Shobe. At the same time, the Orange County Sanitation District had a problem: as farmland turned into housing divisions, the pipes needed to prevent flooding during rain storms were no longer large enough. From that decision came one of California’s best-unsung innovations that has made its way across the globe, especially to places where water is in short supply because of drought. 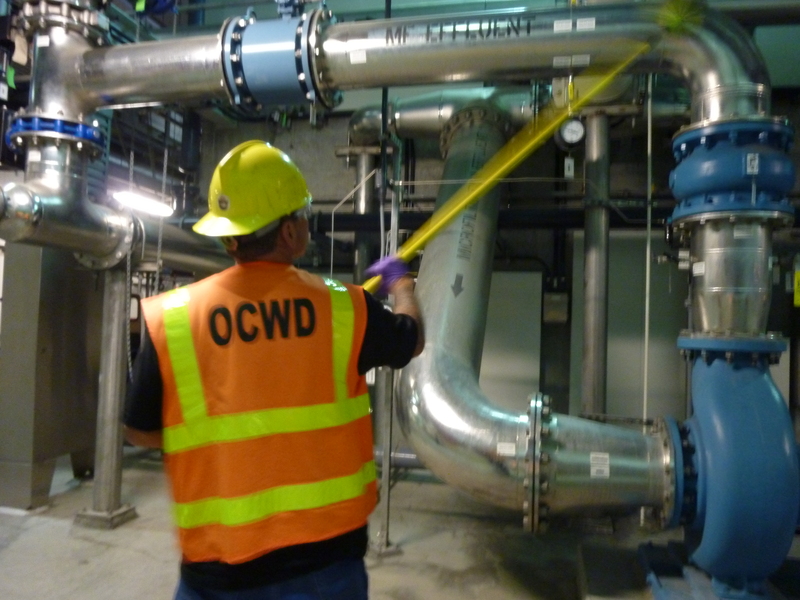 OCWD takes the Sanitation District’s treated used water and puts it through a three step process that purifies it into some of the cleanest water you’ll find. After the water is purified, it is pumped back in the groundwater basin for later use. Microfiltration: Water is forced through holes in these tiny straws that are 300 times finer than a human hair. Pre-treated wastewater is put through pipes filled with fine white straws with holes 300 times smaller than a human hair. Walking through the plant sounds a bit like being surrounded by giant washing machines – except they are actually washing water. Reverse Osmosis: Water is forced through membranes 1,000 times smaller than a human hair, filtering out bacteria, viruses, and other contaminants. Reverse osmosis is the second step in which water is pushed through membranes 1,000 times smaller than a human hair. These membranes filter out bacteria, viruses, pharmaceuticals and anything that managed to make it through microfiltration. As an extra layer of protection, water is exposed to high-intensity ultraviolet (UV) light with hydrogen peroxide (H2O2) to disinfect and to destroy any trace organic compounds that may have passed through the reverse osmosis membranes. The UV light is similar to the lights used in tanning beds. The result of this process is water that is so pure, minerals must be added back into it. Sure, it’s clean – but how does it taste before minerals are added? You can try a glass at the end of a tour of the GRWS plant and it’s flat – like nothing at all. It tastes like water! The result is water so pure that minerals must be added back into it. The purified water is then pumped back underground to protect the aquifer from seawater intrusion and to serve the needs of the surrounding community. OCWD is currently expanding the GRWS plant to ensure a reliable water supply for Orange County, even through natural disasters like drought. OCWD’s Groundwater Replenishment System and Mehul Patel receive visitors from around the world who want to build similar plants in their own communities. When asked if OCWD’s was the first plant, he says no – “Singapore and Brisbane, Australia were the first two groups to catch on to this solution. They worked with us and used the technology we were developing to build their plants before ours was completed.” He explains that each city was experiencing a water shortage so severe, they had to act extremely fast. Singapore’s issue was similar to Orange County’s in that their population was booming and it was difficult to keep up with new demand. It rains quite a bit in Singapore. Unfortunately, they have no way to capture that water. They sent engineers and scientists to Orange County throughout the 1990s and implemented the system OCWD created before the Groundwater Replenishment System was built. Singapore & Australia implemented Orange County’s systems quickly due to severe water shortages. Photo Credits: Temple – William Cho, Hang gliding – the magnetic west, Singapore skyline – Jimmy McIntyre, Trees – the magnetic west. Brisbane had the opposite problem. It simply stopped raining in Queensland, Australia – the drought was so bad and prolonged, it severely dried up the great Murray River (Australia’s answer to America’s Mississippi). Patel notes that “reservoirs were running dangerously low, so the Queensland Government adopted our system, believing that if it was good enough to satisfy California’s strict rules for water quality, it would work for them.” They built four different plants within three to four years. Today, Patel says that many groups come from the Middle East and from Asia, as well as from industrial interests like computer chip manufacturers and dye makers, who want to figure out how to make their water budget go farther. A steady supply of clean water is a basic requirement for a healthy economy and a healthy population. As water budgets shrink, populations grow, and the climate changes, cities all over the world need to find ways to increase their water supply. OCWD’s innovations in purifying used water fulfill an international need, as well as addressing drought and seawater intrusion right here at home.